isicad :: C3D Labs: "By experience we are comparable with the leaders but we work faster!" What makes C3D functionally different from other commercial 3D modeling kernels? To what extent such differences are important for your actual customers as well as the companies interested in C3D? Oleg Zykov: The major difference is that in the same product developers get modeling kernel, geometric constraint manager and converters. This is important, so the majority of our first customers licensed all three components together. In my opinion, any deeper comparisons are meaningless. Most frequently customers test how kernels can solve their crucial tasks: every customer’s products are different so developers also have to tackle different problems. Therefore, my answer is that functional differences are not that essential to the users. What matters is the product in its entirety, the ability to solve specific tasks and be economically efficient. 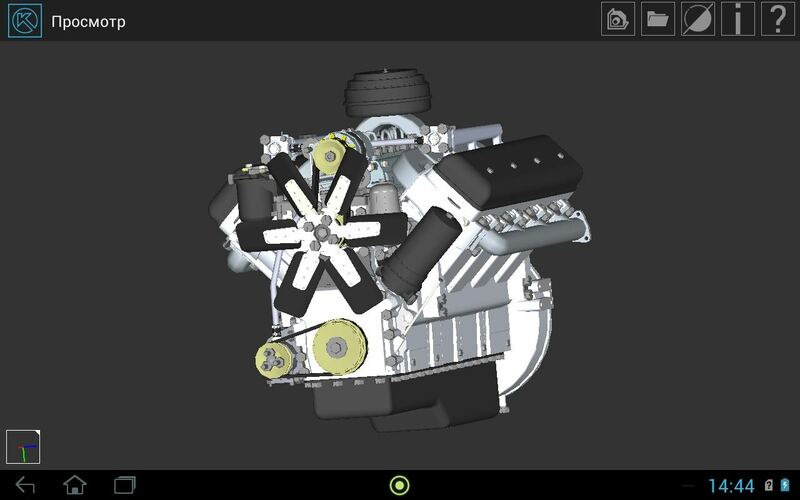 With which 3D modeling kernels you had to compete in the past and are competing now in the eyes of your customers? Would you kindly share an interesting success story when C3D was forced to compete with other kernels and as a result a customer made one’s choice in your favor? Oleg Zykov: The market does not have that many kernels so we compete with all of them! 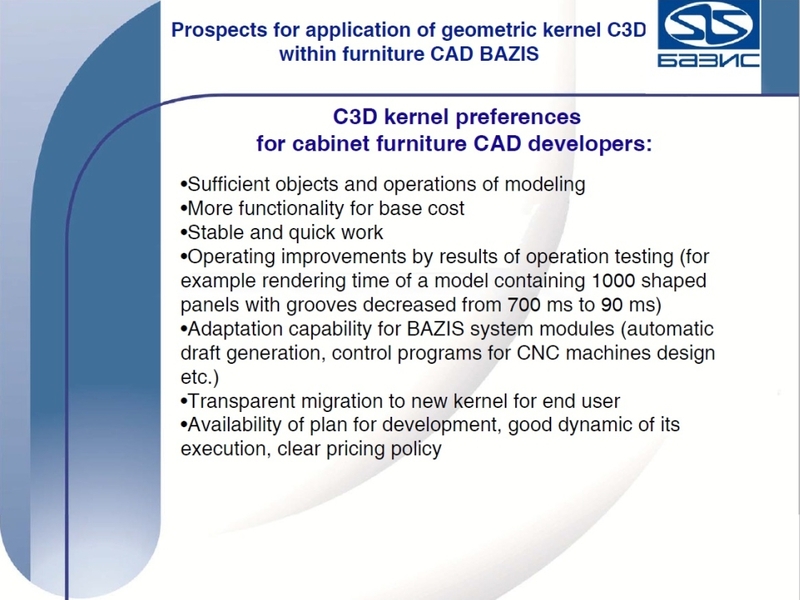 At the moment the segment where we work is quite clear: CAD developers who find the leading kernels unreasonably expensive, but feel the need of a breakthrough in developing their products. Those companies either write mathematics for their product themselves, or use open source projects, most frequently — OpenCASCADE. A company can attempt a functional breakthrough, which would be a long and expensive process, or can take advantage of a ready kernel. The best success story is BAZIS, which considered all kernels available in the market – it took them nearly half a year to test different options. We were slower than one of our competitors in a particular key operation for BAZIS, but our reaction was prompt, the operation in question was optimized and ultimately we secured the best perfromance among all solutions on the markets. As a result, BAZIS chose C3D. Can you describe C3D licensing scheme in broad lines for your readers and how it differs from the offers of your competitors? Are the commercial conditions of C3D licensing strictly fixed, or are they different for each customer? Do you offer any discounts, for instance, for Russian companies? Oleg Zykov: The main difference of C3D is that we adjust to a customer’s business model. Each developer is unique, and has its own vision of the market and the company’s position, sales patterns, etc. Our basic licensing scheme is standard for the market: the license costs, the costs of technical support, and royalty on sale of the software developed on C3D. But what if, for instance, a vendor has free software, while its business is in a different field? Or if there is a cloud project designed for dozens of thousands of users? For such a vendor we will offer conditions without royalty but with fixed transparent annual payments. So far we do not have two identical contracts for kernels — as I already mentioned, we treat each customer as unique. This is our power: C3D has a unique market position. Our experience is comparable with Parasolid and ACIS, C3D kernel is equally well tested through real use in CAD, but at the same time, since we do not have a great number of customers, we are free to choose any strategy with regard to the prices and licensing conditions. C3D Labs has a start-up flavor (it is not a coincidence that we are taken to Skolkovo Innovation Center)! No other similar product is available on the market, except perhaps CGM. Thus, if you are involved in CAD development and do not use a commercial geometric kernel yet, you have only one option — come to us! How C3D quality assurance and technical support are built? Nikolai Golovanov: To enhance the quality of our product we use static code analyzers, unit-tests, performance testing, automated compilation and packaging, and automated regression tests. Every day geometric kernel compilation, unit-tests verification, as well as testing of model updating, building of flat projection and data conversion take place in an automated mode. 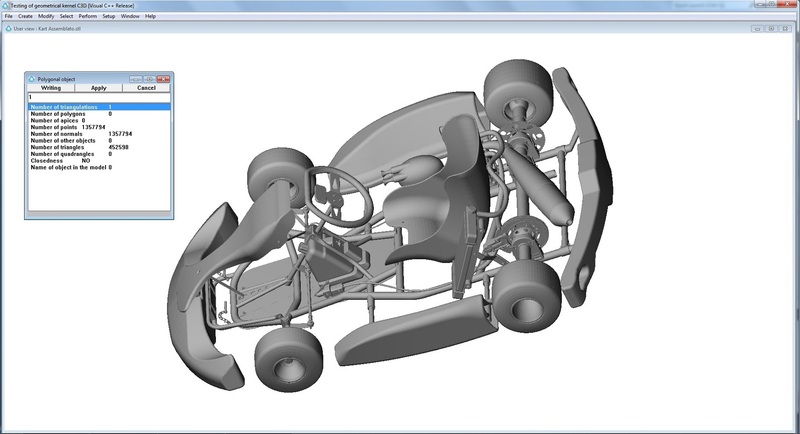 For the purposes of testing, we use a tailor-made database of models. Our largest collection is for testing the algorithms of solid body generation, it contains over 220,000 models (oh, yes, it is not an error!). Every day we obtain a report from the automated system on the tests results. Twice a month a distributive of C3D geometric kernel based on revisions that successfully passed all tests in an automated mode is built; and all our customers who paid for technical support receive a new version every fortnight. Technical support for the users is provided through ASCON customer support service - Servicedesk. The system is convenient for us as well as for the users and is fine-tuned by many years of employment at various ASCON units. Customers are not affected by sickness or business trips of particular employees: several persons all at once are got involved in C3D issues. Errors are corrected pretty promptly: most frequently a customer receives an update in two weeks. I do not think that any other developer of geometric kernels can guarantee the same promptness. I would emphasize, however, that we offer technical support only on a fee-paid basis. For my part, I’d like to say that under our new technological project - Geometry Comparison we develop integration with C3D kernel and we can evaluate the level of support for its users. Its fast response is truly impressive, meeting the highest world standards for technological components. Nikolai Golovanov: It’s nice to hear! LEDAS is one of the most active users of C3D, and your specialists “burden” our technical support team on a regular basis. Which is good – thanks to you we are going forward, for instance, in the near future we will add support of export of simple attributes for faces in STEP. For a long time, ASCON Group has been successfully selling end-user CAD-products, to which C3D does not belong – it’s a licensed component for integration in end-user products. Based on experience, what are the differences in the management and marketing of component products? Oleg Zykov: Yes, the differences are considerable. When Ken Versprille just started consulting us, the first thing he asked was whether we understood the difference in approaches to selling CAD-systems and CAD-components. Two circumstances helped us start working on the new market. First, over a number of years ASCON has been supporting external developers creating applications for KOMPAS-3D — we consult on API usage, and build up business relations. Therefore, we do have experience of working with developers like ourselves, not just CAD end-users. Second, ASCON has established good relations with many market players and cooperation in C3D integration is simply becoming another area of collaborative efforts; for instance, the case with “Truboprovod” Piping Systems Research and Engineering Co., for which ASCON has acted as a reseller for a number of years. You do not need mass marketing, attractive leaflets and striking presentations. It is important to communicate specific, high-quality information to consumers and work with every customer on an individual basis. It does not mean that there is no kernel marketing at all: for instance, we just hired a new product manager, and very soon we will launch a dedicated web-site - c3dlabs.com! In your opinion, what is the C3D application niche: just mechanical CAD or your current and potential customers include companies with a different specialization? Oleg Zykov: Dear me! You too - spread the myth that we are in MCAD only? Let me remind you that КОМPАS-3D is not only MCAD, but also an AEC-product. A smart building design technology developed by ASCON - MinD (Model in Drawing) is fully built up on KOMPAS product line, which means - on C3D. New projects in this field are also based on our kernel. Moreover, in my view, AEC requirements to a geometric kernel do not differ much from the requirements to mechanical CAD. 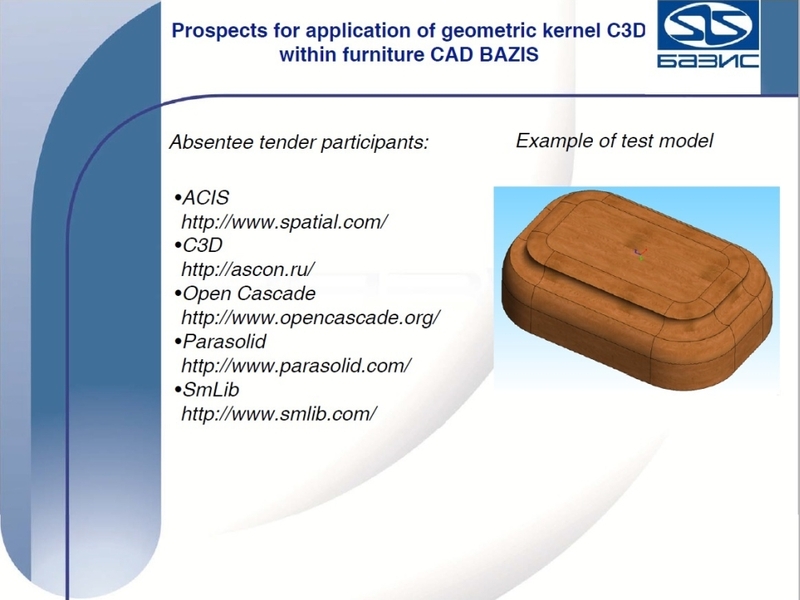 Talking about our customers, BAZIS and GeoS are furniture CADs, “Truboprovod” is a computational packages. Anything but MCAD. C3D geometric kernel can be used in any CAD focused on machine-building, instrument-making, construction, geodesics and other sectors where it is necessary to describe a geometric form of a modeled object. Can a wider, than at present, use of C3D kernel by ASCON facilitate a more active penetration of the company in the market niches that currently are not essential for ASCON? 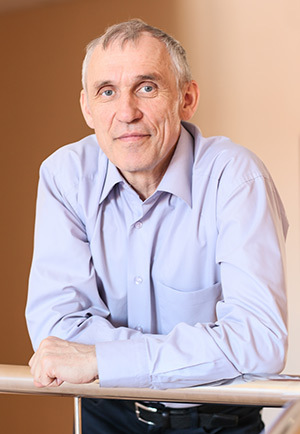 Oleg Zykov: Kernel is not the driver leading a company to new niches; if anything — when a particular ASCON unit is working on a new product in a new market niche, we get requirements and we fulfill them. For example, lately released КОМPAS:24 for Android required porting the kernel to a platform that was new for us. We are the last in the chain: there are CAD consumers, vendor’s marketing experts study their needs, formulate requirements for CAD developers, who then formulate the requirements for us. Our objective is to be ready for changes, foresee them, and work to lead. On the other hand, a growing number of C3D customers in the furniture sector, for instance, does not mean that ASCON will also decide to move in this direction. Although, implementing specific customer requirements we improve C3D for furniture-makers, and it wouldn’t be such a bad idea to take advantage of it... However, it’s better to be at the top in one’s field! Developers of well-known 3D modeling kernels also release other products that enhance kernel potential for some specialized tasks. 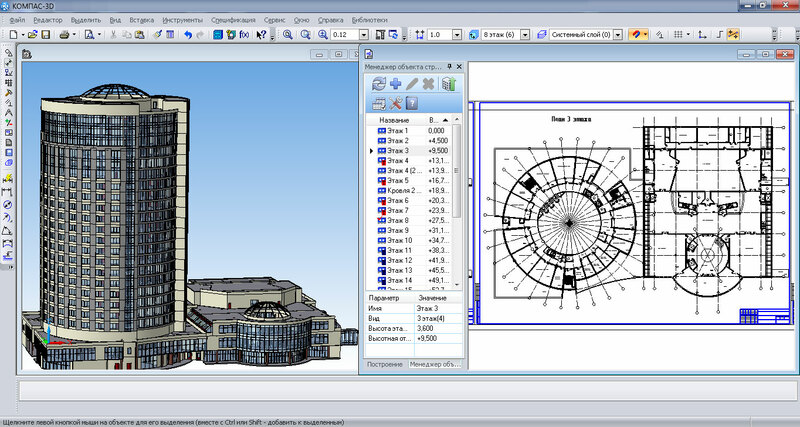 An example is Collision Detection Manager produced by Siemens PLM Software in addition to Parasolid. Are you going to develop products supplementing C3D functions? 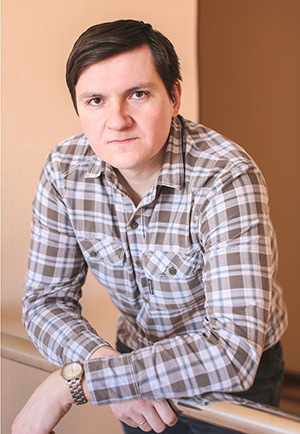 Nikolai Golovanov: Our product inherently possesses sufficiently powerful functions. Anyhow, we have a special function to detect colliding objects (Collision Detection). Apart from the geometric kernel, our product has a parametric kernel and converters. Some vendors register, for example, direct modeling functionality as separate products. The contents of C3D kernel differ from its analogs, and we plan to include all our new functional capabilities in C3D kernel rather than market them as individual products. What is the attitude of C3D team to the capabilities offered by modern architectures and platforms, such as parallel computations, “cloud” integration, computations with use of graphic processors? To what extent are you going to employ these capabilities to develop C3D kernel? Nikolai Golovanov: We favor new platforms and technologies and tend to use all mentioned above to maximize kernel development. We adopt everything that can expand the scope of application, improve functionalities, the performance, reliability and quality of our product. However, we shall not waste efforts on a new technology only because it is fashionable. Our approach to development is purely practical. User needs are the main factor, based upon which we decide where our efforts must be primarily focused. From your paper about C3D development history we know that each year C3D is enriched with new advancements. What creative plans does your team have for 2014? Nikolai Golovanov: One novelty is already implemented in 2014: STL and VRML import. Generally, in 2014 we will concentrate on enhancing the quality and performance of C3D kernel and improving its documentation. To increase the quality, we will refine functions, in particular, the algorithms of building up fillets, thin-walled bodies and sheet bodies. We also plan to improve an automated testing system and enrich the base of test models. To improve the performance, we will modify the algorithms and expand the use of parallel computations. To advance C3D documentation, we will draft new manuals and tutorials in Russian and English, and extend the existing documentation.